The Carnegie Institution of Washington founded the Department of Terrestrial Magnetism in 1904. 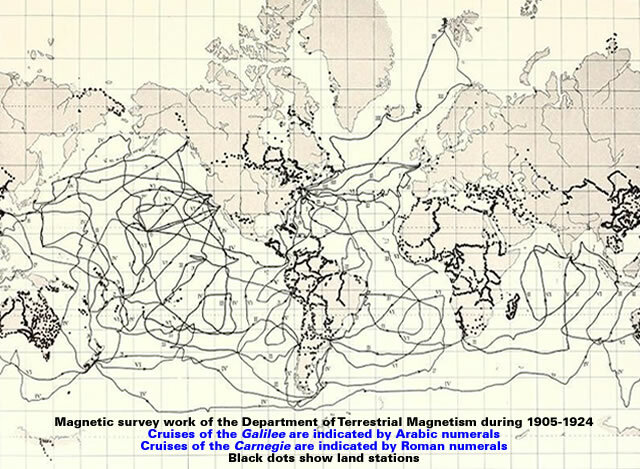 The Department of Terrestrial Magnetism was founded in 1904 to map the geomagnetic field of the Earth. Over the years the research direction shifted, but the historic goal – to understand the Earth and its place in the universe – has remained the same. The Department of Terrestrial Magnetism then embarked upon an amazing 25 year journey during which they charted the Earth’s magnetic field. Scientists at the Department of Terrestrial Magnetism (DTM) bring the perspective of several disciplines to broad questions about nature. DTM’s name comes from its original role to chart the Earth’s magnetic field. This goal was largely accomplished by 1929. Ault, J. P.; Mauchly, S. J.; Peters, W. J.; Bauer, Louis A.; Fleming, J. A. 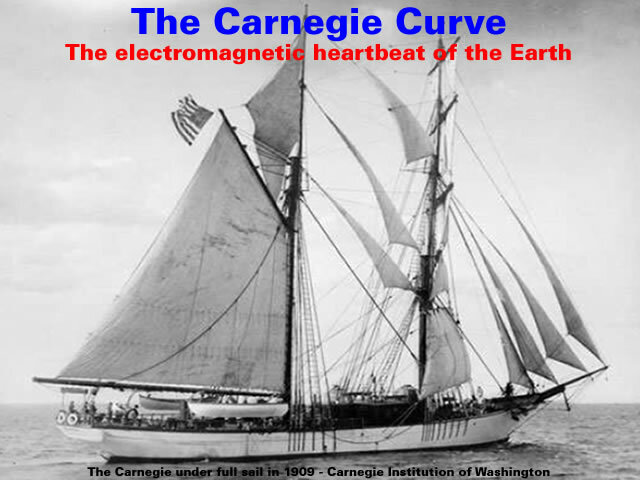 The voyages of the sailing ship Carnegie from 1915 until 1921 not only contributed to the charting of the Earth’s magnetic field but also measured the electrostatic voltage gradient in the air above the Atlantic, Indian and Pacific oceans. 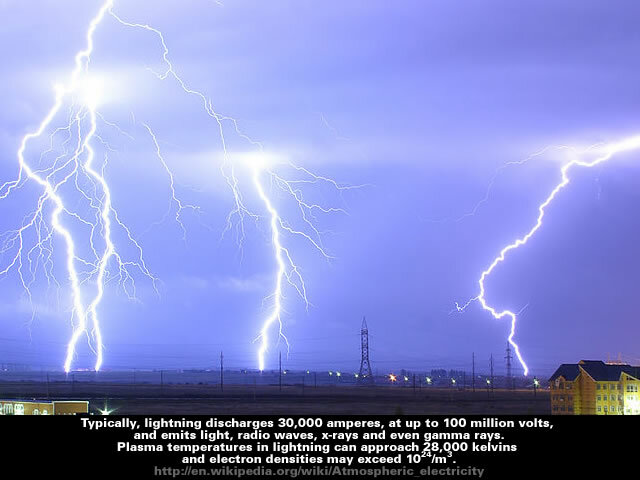 Sky voltage refers to an electrostatic voltage gradient that is present in the free air of the atmosphere, and which can have a different voltage potential relative to the surface of the planet. The gradient varies with atmospheric humidity, dropping lower on days with high humidity, and higher in very dry air. The voltage potential averages about 120 volts per meter. The ‘fine day’ net positive charge sets up an electric field between the negative Earth and the net positive charge in the air, and this electric field stores electrical energy. The positive charge acts by induction on the earth and electromagnetic devices. Experiments have shown that the intensity of this electric field is greater in the middle of the day than at morning or night and is also greater in winter than in summer. In ‘fine weather’, the potential, aka ‘voltage’, increases with altitude at about 30 volts per foot (100 V/m), when climbing against the gradient of the electric field. This electric field gradient continues up into the atmosphere to a point where the voltage reaches its maximum, in the neighborhood of 300,000 volts. This occurs at approximately 30–50 km above the Earth’s surface. From that point in the atmosphere up to its outer limit, nearly 1,000 km, the electric field gradient produced in the lower atmosphere either ceases or has reversed. The measurements of atmospheric electricity can be seen as measurements of difference of potential between a point of the Earth’s surface, and a point somewhere in the air above it. The atmosphere in different regions is often found to be at different local potentials, which differ from that of the earth sometimes even by as much as 3000 volts within 30 metres. The electrostatic field and the difference of potential of the earth field according to investigations, is in summer about 60 to 100 volts and in winter 300 to 500 volts per meter of difference in height, a simple calculation gives the result that when such a collector is arranged for example on the ground, and a second one is mounted vertically over it at a distance of 2000 meters and both are connected by a conducting cable, there is a difference in potential in summer of about 2,000,000 volts and in winter even of 6,000,000 volts and more. In the upper regions of the atmosphere the air is highly rarefied, and conducts like the rarefied gases in fluorescent tubes. 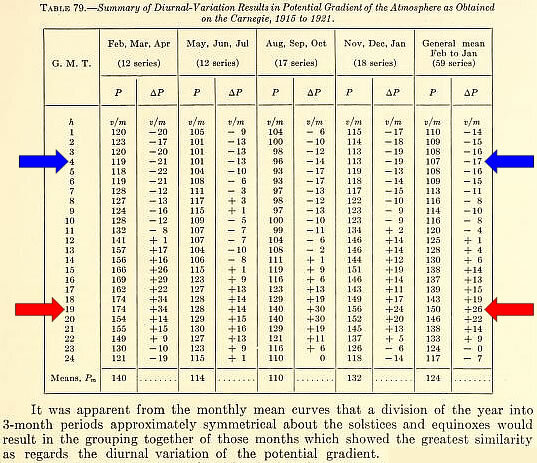 Volta, over a century ago, discovered with some degree of exactitude that the proportions of the ordinates of the curve or gradient of electric potential increased as the distance from the earth increases, and, more recently, Engel has provided data to calculate the increase. It appears that the electric density increases 88 volts with each metre of altitude above the earth, or, in feet equivalents, 1-19 volts per foot of altitude. The analysis of the electrostatic voltage gradient data collected onboard the Carnegie was undertaken by S. J. Mauchly. Remarkably, the analysis undertaken by S. J. Mauchly revealed a global daily pattern in the electrostatic voltage gradient [over the oceans] with a peak at 19:00 GMT and a low at 04:00 GMT. 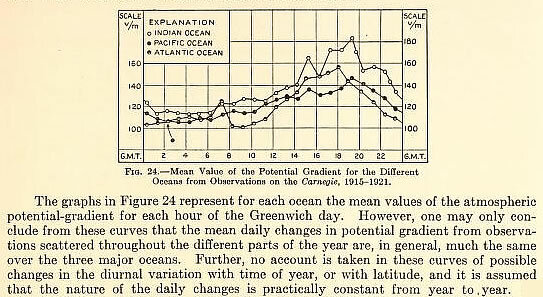 An extended Carnegie dataset [including data from cruise VII 1928-1929] has been analysed by R. G. Harrison and the daily pattern in the annual average of the electrostatic voltage gradient has been slightly revised with the daily peak occurring around 18:30 GMT and the daily low occurring just before 03:00 GMT. The Earth’s fair weather atmospheric electric field shows, in clean air, an average daily variation which follows universal time, globally independent of the measurement position. 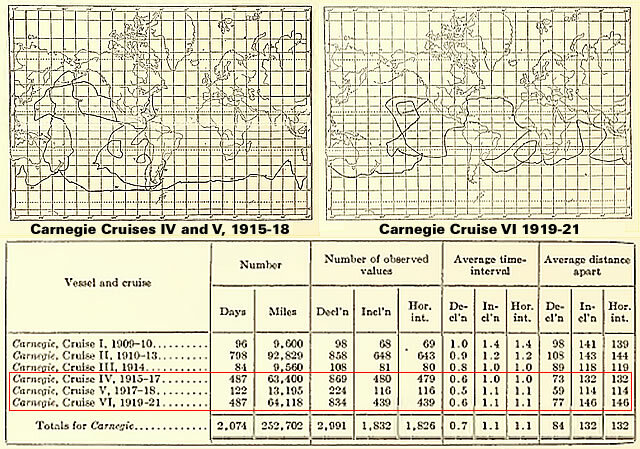 This single diurnal cycle variation (maximum around 19UT and minimum around 03UT) is widely known as the Carnegie curve, after the geophysical survey vessel of the Carnegie Institution of Washington on which the original measurement campaigns demonstrating the universal time variation were undertaken. Intriguingly, an increase in the voltage gradient is associated with a rise in the cloud base. Measurements with a laser ceilometer – a device that determines the height of a cloud base – done in Sodankylä, Finland and Halley, Antarctica, revealed that the cloud base rises an average of four metres for a 1% increase in fair-weather electric-current density. This means that shifts of up to about 200 m per day are possible. Global atmospheric electricity exhibits a daily cycle, hitting a minimum at around 03:00 GMT and peaking at roughly 19:00 GMT – when activity is high in thunderstorm hotspots such as Africa and North America. This cycle was discovered in the early 20th century on board a ship operated by the Carnegie Institution of Washington. This variation is known as the Carnegie curve, or as Harrison puts it more poetically, “the fundamental electrical heartbeat of the planet”. Harrison and Ambaum found that the base height of the layer clouds they looked at showed a similar cycle to the Carnegie curve. They believe the effect may be due to the charging of small droplets in the cloud’s base, which encourages them to stick together. Unsurprisingly, the Carnegie Curve is closely aligned with thunderstorm activity. 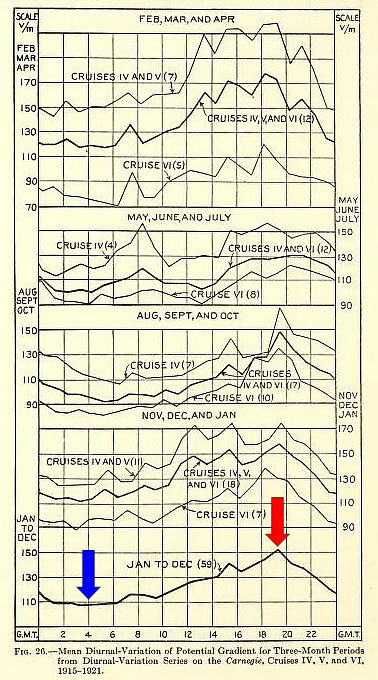 Comparison between total land thunderstorm area (thick solid line, left-hand axis) with its regional contributions, as originally presented by Whipple and Scrase (1936), and the Carnegie curve (grey dashed line, right-hand axis) calculated as relative values from annual coefficients of Table 4. The seasonal range in timing of the Carnegie curve’s maximum and minimum is shown by horizontal bars about their annual mean values. However, the mainstream strangely flips into “whatever” mode when it comes to “the origin of the net unbound positive charge in the atmosphere”. Most authorities agree that whatever may be the origin of the net unbound positive charge in the atmosphere, the generation of enormous currents (flow of electrons, negative charges), that flow between clouds and ground during a lightning discharge, begins with condensation of water vapor within the clouds; each minute water droplet moving through the air collects upon its surface a certain amount of negative charge by collecting ‘free’ electrons. As these tiny drops coalesce into larger drops, and still larger drops, there is a corresponding decrease in the total exposed surface upon which the collected electronic charges can be carried, raising the negative voltage as droplets combine. This is surprising because the observed winter increase in the voltage gradient very strongly suggests that the “net unbound positive charge in the atmosphere” is associated with the Earth’s distance from the Sun. Experiments have shown that the intensity of this electric field is… greater in winter than in summer. If the voltage gradient is primarily driven by the Sun then the maximum effect would be when the Sun is overhead at 12 noon. The 18:30 GMT maximum occurs when it is 12 noon at 97.50 degrees West and the 03:00 GMT minimum occurs when it is 12 noon at 135.00 degrees East. Unsurprisingly, both of these longitudes are associated with strong centres of geomagnetism. This evidence leads directly to the “near local noon” Polar Cusps in the magnetosphere. In the sector near local noon – the “cusp” – auroral zone field lines incline and curve directly into the solar wind. This channels solar plasma all the way down to the ionosphere. Solar wind particles can enter the planet’s magnetosphere through the cusp region. 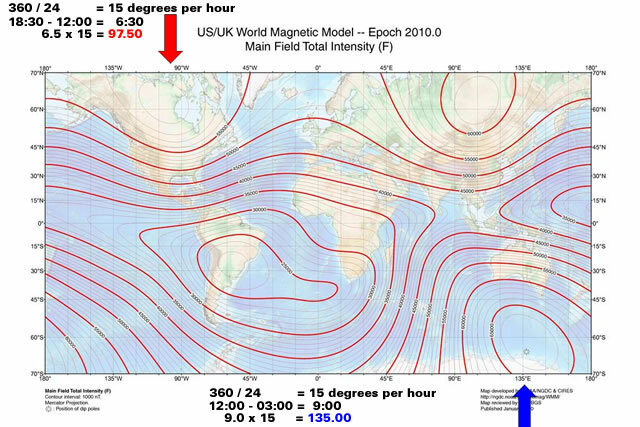 Therefore, the 18:30 GMT daily maximum in the atmospheric voltage gradient [net positive charge in the air] very strongly suggests that positive charge [from the solar wind] predominantly enters the atmosphere via the Northern Polar Cusp when it is aligned with the Earth’s magnetic main field. Conversely, the 03:00 GMT daily minimum in the atmospheric voltage gradient [net positive charge in the air] very strongly suggests that negative charge [from the solar wind] predominantly enters the atmosphere via the Southern Polar Cusp when it is aligned with the Earth’s magnetic main field. Presumably, it is this basic electromagnetic circuitry that causes the mainstream to blow a fuse and flip into “whatever” mode when it comes to discussing “the origin of the net unbound positive charge in the atmosphere”. Gallery | This entry was posted in Astrophysics, Earth, Geomagnetism, Magnetism, Tides. Bookmark the permalink. Tim, fascinating as usual, can this Volatge charge be used in any way for Power Generation? Tall insulated metallic objects can absorb these voltage gradients out of the atmosphere, and conduct the voltage to a terrestrial collection and measurement station. Low-power electrostatic motors and toys can be driven from this collected sky voltage when one side is connected to earth ground, and the other is connected to the sky collector, such as a kite or balloon with a foil collector and fine wire running down to the ground. A collector 200-300 ft high can develop a sky to ground potential as high as 20,000 volts. Tesla also proposed to use the atmospheric electrical circuit to transceive wireless energy over large distances. It’s just amazing the things you find that I have never seen before. I will have to re-read this several times to digest it all. Fascinating. I became curious about whatever happened to that beautiful ship. Here is an interesting writeup that describes all the work they had to go through to make sure nothing magnetic on the ship affected the data. I wonder if this is what is responsible for the “bolt from the blue”. The Wikipedia page on ‘Sky voltage’ was deleted a month after this blog post appeared. It can still be viewed via The Wayback Machine.